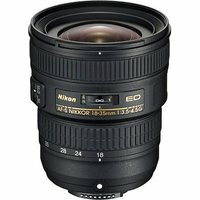 The Nikon 18-35mm f3.5-4.5G AF-S ED Nikkor Lens is a 1.9x ultra-wide angle zoom lens with a minimum focusing distance of 28cm. Versatile and lightweight, the Nikon 18-35mm f3.5-4.5G lens features improved optical construction and a Silent Wave Motor (SWM) for quiet, fast autofocus. This powerful lens is equipped with 2 ED and 3 aspherical lens elements for superior optical performance, yet weighs just 385g and is extremely portable.